Each year at least 60% of the wildlife we admit to our Centre have been caught by cats. Although we try to save all of the critters brought to us, many succumb to severe wounds, stress from being caught by the cat, or blood poisoning (Pasturella) caused by the cat’s teeth or claws. We have had the remains of nests brought to us after cats destroyed the nests. Usually the nestlings are killed but on occasion a few survive and are brought to us to raise. We spend endless hours trying to save the many wounded nestlings and fledglings that are admitted to our Centre. This needless suffering would not take place if cat owners kept their pets indoors. For the sake of your cat, and to protect wildlife, we strongly advise that you keep your cat indoors. We have a number of cats at our centre and to ensure that they do not harm themselves, or any of the wildlife around our property, we built a cat play area for them. They can access this by going through a cat-door in our kitchen and can lie in the sun, play with their various toys, scratch the natural wood scratching posts, etc. and be completely safe. Our cats have come to us from varying origins, including one cat that was semi-wild, and ALL have adapted to this lifestyle without difficulty. 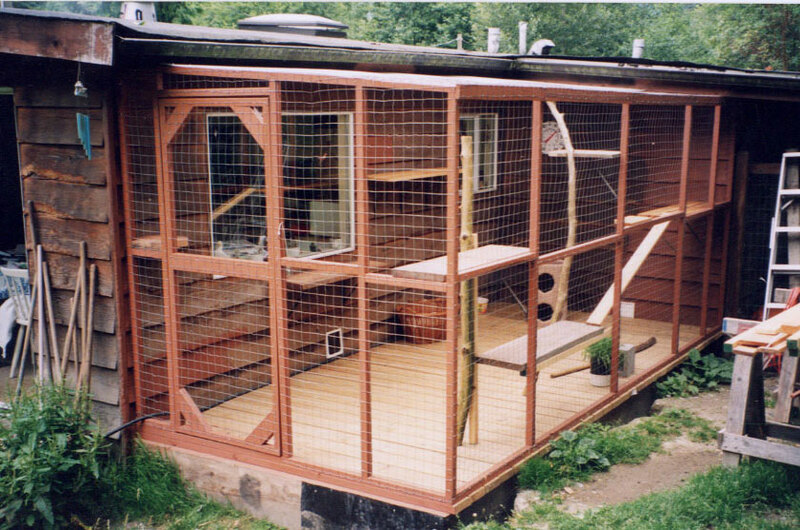 If you are unable to build a play area for your cat, consider a screened porch or balcony. Here is a photo of what we built for our cats – and they love it! Hit by vehicles – thousands of cats are killed by vehicles each year. any cats are injured when, seeking warmth, they crawl under car hoods and are killed or maimed when the car is restarted. Attacked or chased by dogs or predators such as coyotes or raccoons. This can result in torn ears, scratched eyes, abscesses, internal injuries, diseases, and sometimes, death. Attacks by other cats can also result in injury and infection. Neighbours who dislike your cat defecating in their garden. Numerous diseases such as feline leukemia or immunodeficiency viruses. Fleas, ticks and other parasites. Sickness from eating garbage or other contaminated morsels. Poisoning from eating rats or mice that have died from rat poison. Wandering off (or being chased) and becoming lost. Some may become the victim of human cruelty. They may be used as a target for kids with BB guns or other such cruel activity. Indoor cats live longer, are healthier and suffer fewer injuries and health complications than outdoor cats. Cats do not bring home all of their prey, it is estimated they only bring home half of what they kill. An estimate based on cat-owning statistics from other North American cities gives greater Vancouver a cat population of over 800,000. With year-round hunting cats it is estimated they could kill 6,400,000 birds per YEAR in Vancouver alone. 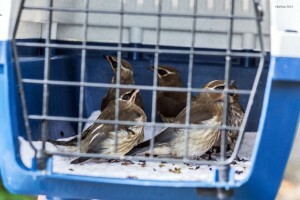 It is estimated cats could kill 6,400,000 birds PER YEAR in Vancouver alone. Today, more than ever, wildlife faces ever increasing hazards. Their habitat is constantly being destroyed, making it difficult to find nesting/denning areas. There are more herbicides, pesticides, etc. being used, thus not only killing the unwanted insects, bugs, but also the birds who depend on this source of food to survive. There is often not much we can do to stop the above from happening but we can do our bit in our little corner of the world by not allowing our cats to roam and further destroy nature. 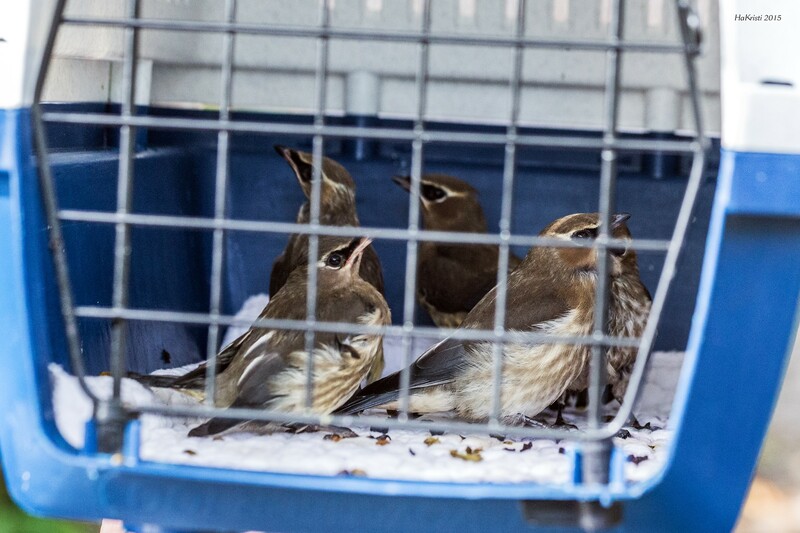 Read more information about the impact of cats on wild birds. Cat Bells – Do they Work? Belled cats do kill wildlife. Cats with bells on their collars can learn to stalk their prey silently. Even if they don’t, wildlife does not necessarily associate the ringing of a bell with danger. During nestling/fledgling season, a newly fledged bird may be learning to fly and be unable to escape a cat attack, whether or not the cat is wearing a bell. The vast majority of birds we receive during nesting season which are caught by cats are fledglings. Even well-fed cats kill wildlife. The urge to hunt is natural for a cat, thus a well-fed cat will still hunt and kill or maim wildlife. If you love wildlife and love cats, please take care of them. Cats cannot be blamed for killing wildlife. It is the responsibility of every cat owner to ensure that their cat is safely indoors, not only for the sake of the wildlife but for the sake of their cat too. Even well-fed cats kill wildlife.